Call and ask to visit their facilities. By visiting a moving company’s facility you will get a feeling on how a place is run and the care that is taken in how furniture is moved & stored. Check to see if they are affiliated with a major van line carrier. Most major van line carries like United Van Lines have strict rules on what they expect from their agents. Do not overfill or underfill your cartons, they may become damaged. Tops must close flat and should be sealed top & bottom with Packing Tape. Cushion all cartons with clean crushed packing paper – on the bottom, between layers, on top and anywhere between articles. Articles packed snuggly will not shift and should arrive safely. Place heavier items from desks & drawers in cartons. Loose clothing may remain in dresser drawers. Place do not move signs on any items that are not to be moved. Take all valuables (jewels, furs, important documents etc) yourself or send by registered mail to your new location. Pick up a “Do It Yourself Packing Guide” at Fidler Moving. If you must move in the “peak” summer season try to choose a date away from the month end – the last weeks of June and August are the busiest moving days of the year. Never plan to move in on your closing day. Quite often there are delays with the people moving out and nothing is worse then having a moving truck sitting idle running up extra charges. 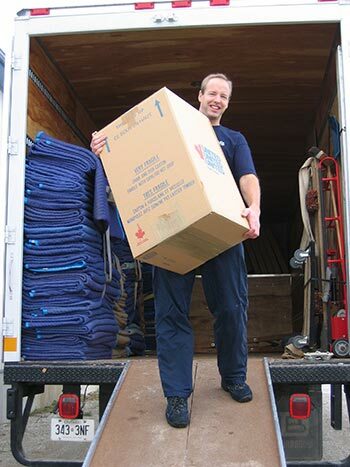 Prepare before you have a moving consultant give you a free estimate. Make sure you mention anything out of the ordinary like extra stops, long walks or storage lockers at another location. If you are considering doing your own packing, arrange to begin months in advance of the move. Packing is much harder work then most people realize and unless you do it for a living you will be overwhelmed. Also note that movers will not take smaller items that are not packed in cartons. If you decide to do your own packing call Fidler Moving about purchasing cartons. Moving cartons are stronger and easier to pack then grocery or liquor store boxes. Use up as much food from your freezer and pantry as possible. You can leave lightweight items in drawers but do not put books, liquids, glass or heavy linens in them. Be sure to remove any valuables like jewellery. Arrange for young children and pets to be cared for during packing loading and delivery days. Fidler Moving & Storage offers 2 types of valuation packages should there be the rare occasion an accident or claim occurs. Built into all moves is a ‘released valuation’ package that covers $0.60 per pound to the maximum of $50.00 per article. Replacement Value Protection (RVP) can be purchased before your moving date with our office. Many house policies cover moving from point A to B in which the released rate would do. If your policy does not cover moving or if your goods are going to be stored with Fidler Moving R.V.P. is strongly recommended. Fidler Moving cannot legally ship flammable items or items under pressure. Customers must haul these items.